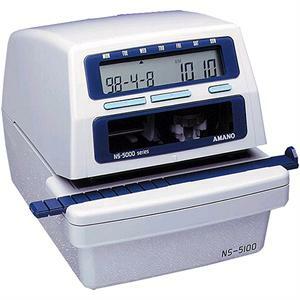 The Amano NS5100 is a programmable electronic time stamp that does it all. This time stamp provides reliable, electronic document control. Wth the ability to pring Date, time, numbers or text all in one machine. The NS5100 uses eight digit numbering or alphanumeric character printing which allows for choice of over 90 print format selections. Adjustable print position stopper and side guide to ensure easy, fool froof alignment. Flexibility to accommodate andy time/date stamping applications. Programmable print size capabilities for a wide range of needs. Over 90 preset imprint formats: alphanumeric. Prints up to eight digit consecutive numbers. Automatically advances year, month, date and Daylight Saving Time. Prints time in regular or military time; AM/PM, 0-23 hours, minutes, tenths or hundredths. Automatic reset each day at a specified time or count as required. Built-in passive battery backup maintains time and data memory during power outages. Dimensions: 6.5" x 6.75" x 8.75"